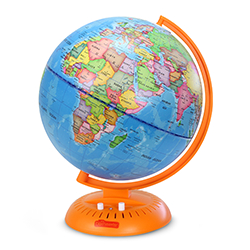 Bulk Unlimited, in cooperation with the U.S. Consumer Product Safety Commission (CPSC), is recalling and replacing its Little Experimenter 3-in-1 World Globe with Illuminated Star Map and Built-in Projector. Bulk Unlimited is recalling the globe because when the globe is spun, the internal wires can break, which can result in the batteries overheating and potentially catching fire. If you believe that your globe is included in this recall, continue reading below to learn about how to participate in the corrective action plan. How Do I Know If My Globe Is Part Of This Recall? If you own the product pictured below, your globe is included in this recall. To confirm, look for the Little Experimenter Logo on the base of the globe. Also, If you still have the packaging you can find the Item #: LE-2600 and UPC: 818907026005. The affected Date Code of 102018-107 is printed on a sticker on the battery compartment cover and on the product packaging right below the UPC or barcode. The globes show the countries in different colors, the oceans in blue and black text for each country, capitals, deserts and ocean names. 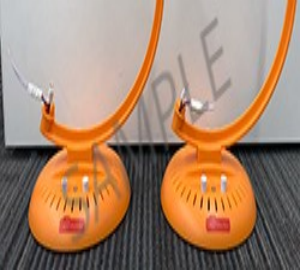 They have an orange base with two white buttons that light up the globe and display a projection of stars and constellations in color-changing motion. 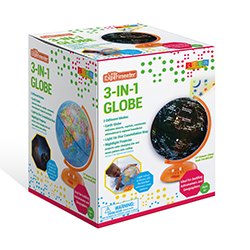 IMPORTANT: Please note, if you do not have a Little Experimenter branded globe as described above, your unit is not included in this recall. You may close your browser, as no further action is required. Recall notices are being sent to all known purchasers of the affected globes. Once you receive your notice, find your Order Number and enter it in the box below. The Order Number is located at the bottom of the recall notice. If you received a Notification from Amazon that includes an order number, you can enter that order number as well. If you do not receive a notice, or you need any assistance, please call the number at the bottom of this page. We will walk you through the steps necessary to complete the registration and qualify for the free replacement globe. The steps will include disabling the battery connection and providing photo documentation. Please be sure you have the globe(s), a pair of scissors and something that can snap and upload a photo before you get started. Please note, the number of replacement globes we ship to you will be based on the number of globes we are able to verify through your photographs. Maximum number of globes you are able to register is 6. In order to complete this registration and qualify for a free replacement globe, you will need to disable the battery connection and upload a photo showing that it is complete. Please carefully read and follow the instructions below. Please open the battery compartment found on the underside of the base and remove the batteries from the battery compartment and set aside. The globe is held by an arm. 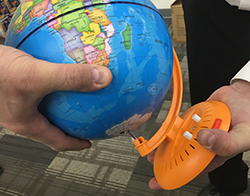 Apply enough force to pull the globe off the bottom connector. The battery wires will be exposed now. Using a pair of scissors, simply cut the two battery wires. 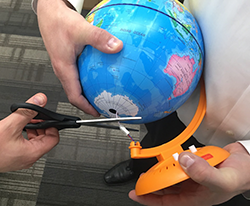 It may be helpful to have another person cut the wires while one holds the globe. Once the wires have been cut, keeping the globe separated from the base, take a clear picture. 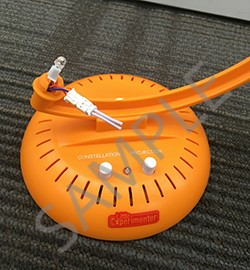 This picture must be in color, show the wires fully cut, and show the Little Experimenter Logo on the base of the globe. See below for an example. If you have more than 1 globe, please capture all globes in 1 photograph. After closely reading the above directions, please upload the photograph that shows your unit(s) with the wires clearly cut. Remember, if you have more than one affected unit, please be sure your photo shows all the globes and that we are able to see the wires cut for each. The number of replacement globes we ship will be based on the number of globes we are able to verify through your photo. You may now reinsert the base back into the bottom of the globe and continue to use the globe. This information will be used to ship your replacement globe(s) to you. Invalid phone number. Acceptable format: 'XXXXXXXXXX'. Shipping address is not recognized. Please verify the information in all fields and correct where needed. If you want to submit the registration with the address as listed, check the box below. If you are sure that the address information in this form is correct, please check this box to continue. If you need assistance, please contact a representative at 1-877-206-1171 between 7 a.m. and 6 p.m. (Central Time) Monday through Friday.